For years I’ve been working on a novel. It was inspired by a trip I took shortly after finishing my first documentary, “Jim Thompson, Silk King” in 2001, though at the time I had no sense of it as anything more than an adventurous vacation. Soon after I returned from it I flew to New York, where JTSK was in a festival; it showed on September 8th. As fate would have it, I got back to Los Angeles hours before the attacks of September 11th, and for a long time no one wanted to think about documentaries, or entertainment in general. After marketing JTSK as much as I could during that grim time, I made its previously planned companion, “The Jim Thompson House and Art Collection.” By this time it was 2005, and my 2001 trip had receded long enough for me to start writing a novel based on it. As I was finishing the first draft, I moved to Beachwood Canyon, which involved selling one house and buying another that turned out to more of a fixer than expected. When I was finally settled, I began preproduction on my documentary Under the Hollywood Sign, another long-simmering idea. Although I initially thought I was making a little neighborhood documentary, Beachwood’s history turned out to be enormous, and UTHS grew into a major project: thirty interviews, many hours of footage and hundreds of images. The project kept me occupied for the next three years, at which point it was late 2009. In 2010, I finally dug out my novel and starting writing again. 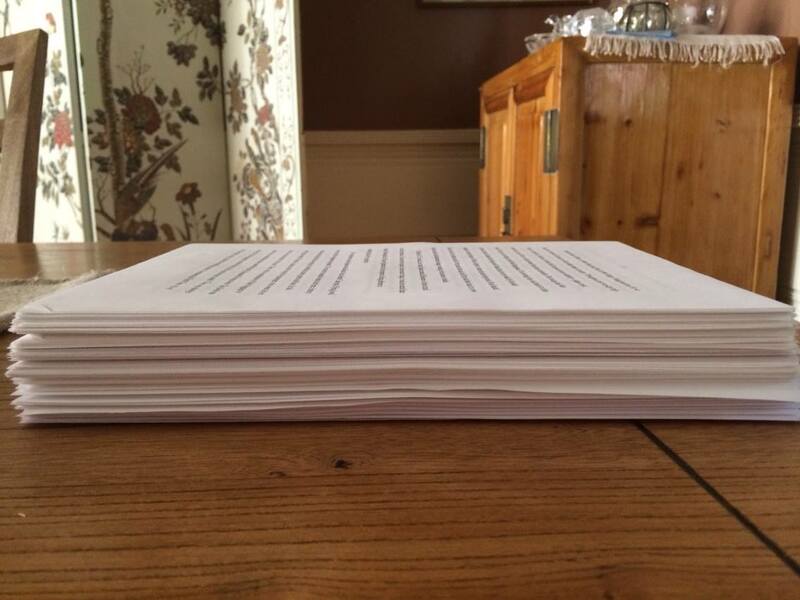 Every summer since then, I’ve done another draft; now, four years later, the result is tangible: a 355-page manuscript about a journey, and the embodiment of my own long trek. Beyond the films and moving house, why did it take me so long? There isn’t any simple answer, but it’s clear that reading novels doesn’t teach one to write them. And writing novels doesn’t equal finishing them: a previous attempt ended in frustration. (Recently I learned that Joyce Carol Oates’s late husband left a novel–his only novel, chipped away at for decades–unfinished when he died. It was not reassuring.) From a practical standpoint, the work would have gone faster if I had revised printed drafts rather than doing it on my computer. Because the novel existed only virtually, a number of gaps and errors went unnoticed for too long. But the biggest setback came during the summer of 2013, when a Time-Warner technician cut the power and crashed my computer. (He had assured me that I could keep working while he ran new cable to the house.) When everything went black, I lost the draft I was working on, including a substantial part of the last section. Although I had saved a previous draft on Dropbox, I was never able to recover what had disappeared. Worse yet, I was afraid to look at the manuscript, much less work on it, for several months. But eventually I did. This summer I knew I had to finish so I soldiered on, finally getting to the end on Labor Day. This month I’ll send the manuscript out to some friends who have kindly volunteered to be my first readers. After that, I’ll work on selling it. One way or another, it will be published. But let’s face it: we’re not living in the Age of the Novel and no one really cares. So why did I bother? Because, with the exception of my (easily fulfilled) goal of motherhood, all my ambitions have paled in comparison to my desire to write a novel: it’s a dream I’ve had since the age of twelve. Accomplishing it has taught me many things, one of which is to love the process, not just the result. And even if only my friends and family read it, my reward has come already: I’ll soon be starting two new projects, neither of which would have come my way if I hadn’t persevered on this one. You are currently browsing the Literature category at Under the Hollywood Sign.